Greek melodic power metal band Emerald Sun sound on their debut album Escape From Twilight more like Helloween that Helloween do themselves these days. So much for the originality factor! But it wouldn’t be fair to dismiss this CD from the start, because after a generic instrumental opener, Emerald Sun show that despite their adherence to Teutonic metal from the late Eighties, they can also write engaging metal songs that always strike a fine balance between epic melodies and faster power moments. The muscular production also helps to distinguish their sound from their influences twenty years ago. The first half of the album is very straightforward, making for non-stop true metal fun, but the last twenty minutes can’t keep up with the first half hour. 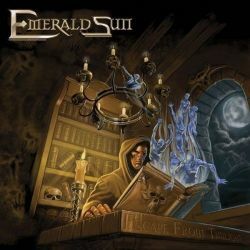 The long instrumental Emerald Sun is interesting as it shows the band from a more playfully progressive side, and the primitive H.M. (stands for "Heavy Metal", of course) is also a little charming, but ending the album with two ballads is commercial suicide, at least in the metal community. So you get a good start and an ending that can’t fulfil the expectations, showing that there is of course a lot of potential in this Greek band, and that hopefully the next time they will be able to keep their initial drive until the end of the record.